Vitamins in the Air, absorb more with Teviron. : Being Free from pain. Do you know of anyone who is suffering in pain and in silent? Do you know this person close to your heart? I do, and they are my parents and both of them are above 60s, and I got to know their pain only after I started wearing Nefful minus ion clothing and bought a full set for them too. 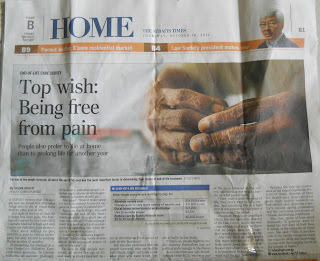 I believe many of our parents suffered from pain too, most of them would not share about their pain. Luckily for me my mom would complained about her pain most of the time more than 4 years ago. Last year I came upon this article from The Straits Times and confirmed my guessing that most parents would be suffering in pain too. Surprisingly they were willing to pay $24,000 a year to relieve severe pain. That is a lot of money giving to the doctors and hospitals. How can I see minus ions (anion) in the air?